Imagine my surprise when Wendy herself handed me my lunch at Wendy's! 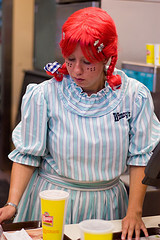 Apparently, the practice of encouraging an employee to dress as Wendy on selected days is going around the hundreds of Wendy's outlets in America. I think this Wendy's employee is getting off easy.